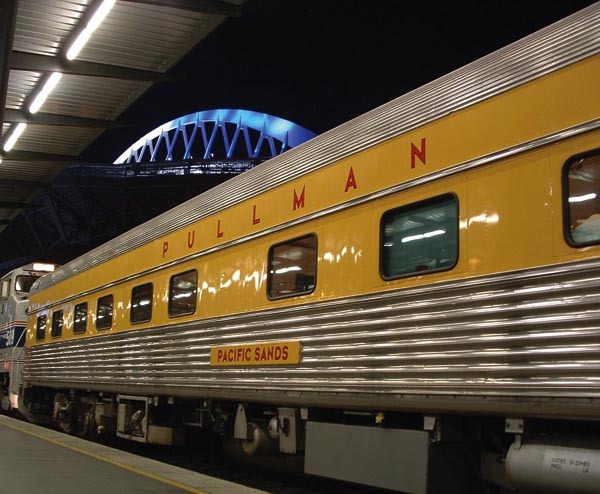 Travel and sleep in traditional Pullman comfort aboard a 10&6 sleeper. Pacific Sands provides 22 comfortable beds as a part of the LARail collection of vintage railcars. The car also features a large shower and beverage/snack service. Built for the Union Pacific by the Budd Co. in 1950. Used on the UP’s “City” trains. Number 1437 added in 1969. Acquired by Amtrak in 1971 and renumbered to 2630. Converted to Heritage sleeper in 1979 and renumbered to 2881. Used systemwide including on Amtrak’s Autotrain. Retired in 1996 and upgraded for private service.